The locals in the Peruvian Amazon call the critter ovejillo (“little sheep” in Spanish), but its full name is Megalopyge opercularis, or colloquially, the flannel moth caterpillar. It’s tiny, just 2.5 inches long, and its fluffy tufts can be red, white, or pink, as well as that Trump-tastic Day-Glo yellow. But don’t let that adorable fluffy exterior fool you into thinking it’s harmless. 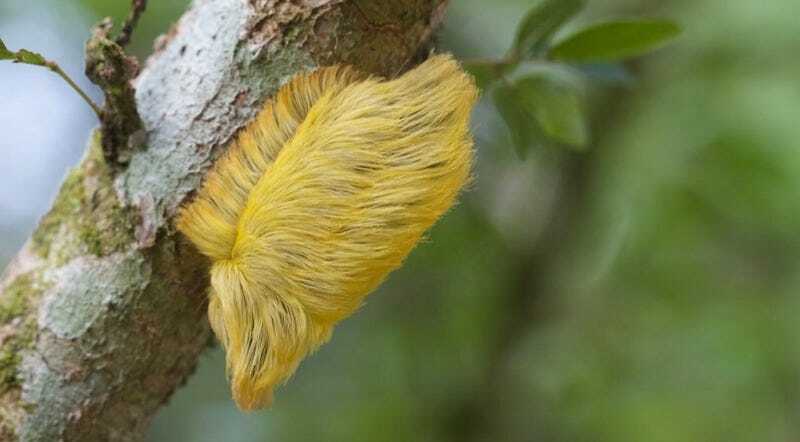 The flannel moth caterpillar is actually venomous, and the hairs have very sharp, hollow spines, akin to a hypodermic needle, the better to puncture your skin and deliver a powerful dose of poisonous toxin. Yep, just like tarantulas, which at least have the decency to look scary. They can break off and lodge in your skin, too. The result, according to Cremer, is bright red welts and rather excruciating pain. There’s some kind of metaphor in there, maybe.